This is another recipe from Penny Pierce in Lakefield, Ontario. One of those that she keeps in her head because she has made it so many times. There is no need to follow the printed recipe because she changes the content every time to include whatever fruit is ripe at the time. The crisp she made last saturday was a four cups rhubarb from her garden and two cups strawberries. Mine today is one cup strawberries, one cup raspberries, one cup red figs, one cup apple and two cups rhubarb, all fresh from The Root Cellar. Penny added sugar to the fruit and I did not, it is just a matter of sweetening the rhubarb. Sometimes, she also adds the zest of an orange. All the fruit is diced, sliced or cut in small pieces, mixed with 2 tbsp flour and laid out in the bottom of an oven-proof dish at least 3″ deep. Deeper is recommended to avoid spilling over. For the crust, Penny mixes 1 cup oatmeal with 1/4 cup brown sugar, and one tsp cinnamon. Then, she adds 1/4 to 1/3 cup of cold butter cut in bits and mixes quickly with fingers, squeezing and tossing so butter gets mixed through but mix is still crumbly. She spreads it on top of the fruit and bakes it at 350 for 55 minutes. Decorate with fresh mint at the last minute. Serve warm or chilled, maybe with Vanilla or Honey ice-cream. Note: Tapioca flour is a good thickener. The more berries, the more flour! More butter is well… more buttery! and a pinch of salt in the crust is good too. 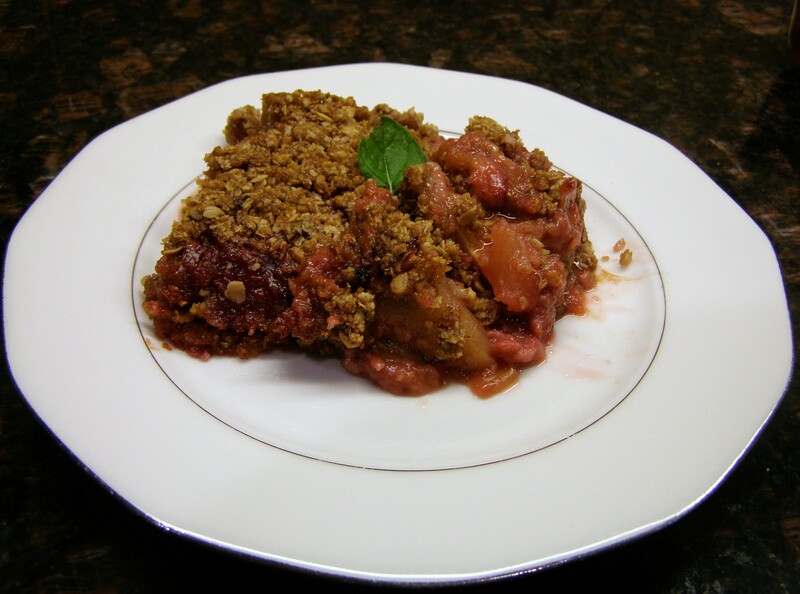 This entry was posted in Baking, Dessert, Vegetarian and tagged berry crisp, dessert, food, recipes, rhubarb crisp, the root cellar, verygoodrecipe. Bookmark the permalink. I have discovered a fake rhubarb crisp for hot weather. There was a miserably humid hot day last week, way too hot to have the oven on. 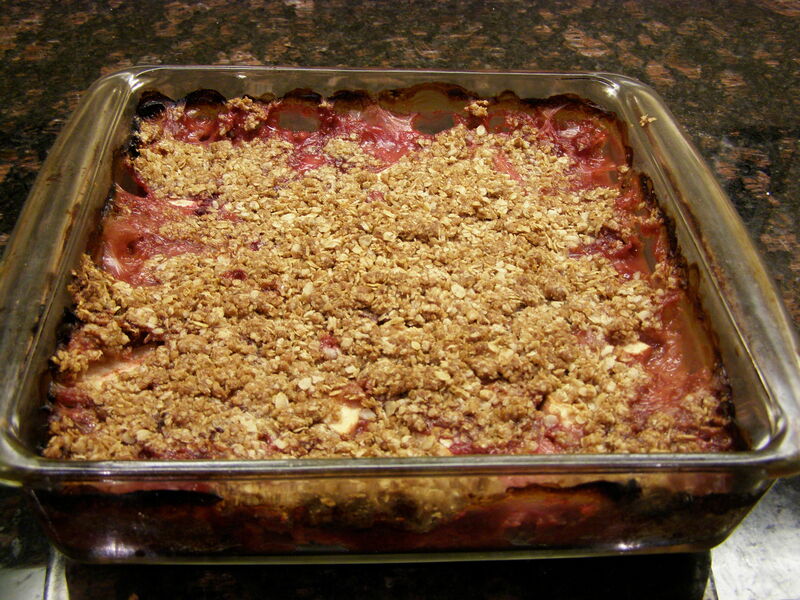 (No air conditioning here on the farm…) But I wanted to make rhubarb crisp. So, I made rhubarb sauce (rhubarb, a bit of sugar, a bit of orange juice; cook on stove top until rhubarb is cooked), then I topped it with some of the granola that you left here, I think it was Harvest Crunch. Good warm or cold. Best thing is that the rhubarb sauce can be kept in the fridge and the granola added as served, so it keeps its crunch. Let’s call this fake rhubarb crisp Rhubarb Crunch! I want the version with the fruit from penny’s garden.